Rothenburg in the morning fog. Getting in the Christmas spirit in Rothenburg. I know, I know: the reason for the season is not Santa Claus. (Believe me, I have strong anti-Santa Claus feelings.) And consumerism and shopping and all that stuff don't make Christmas Christmas either. But there is something so cozy and nice about drinking some hot Gluhwein (mulled wine, for all those who haven't experienced the magic of the Christmas season in this part of the world!) as Christmas music plays, lights and greenery decorate every building in sight, and people are happily munching on Bratwurst and hot waffles. Really, it's a lot of fun, and the Germans do it well. John and I headed to the Bavarian city of Rothenburg this past weekend. 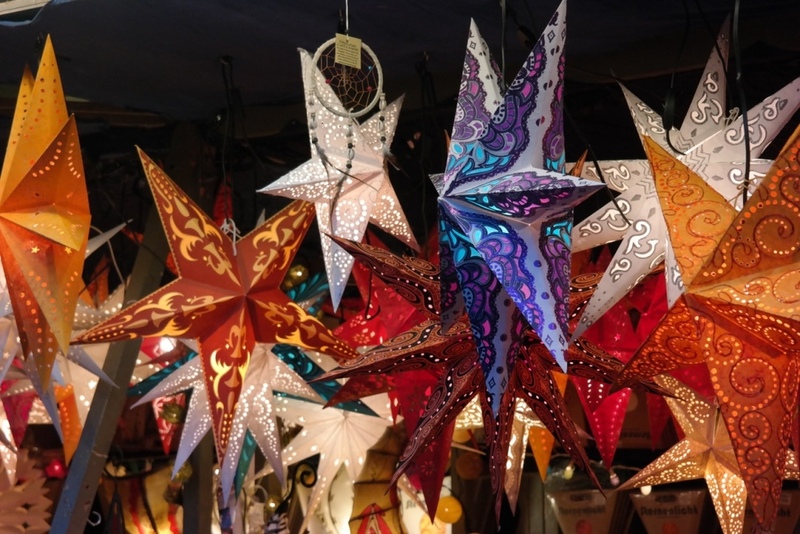 We'd heard about its Christmas markets, as well as its Germanic charm. I'll be honest: the city was beautifully decorated, and its markets were lovely but weren't my favorite. (They were good, but maybe I was spoiled by previously browsing the extensive booths and selection in Munich.) BUT the city is so worth visiting, because it is absolutely charming. A view of the city taken from the city walls. Yup, that building says 1617. Gorgeous, isn't it? I am starting to recognize more of what's written around me after almost seven weeks of German class (5 days a week, 3 hours a day) under my belt. For example, only this week did I learn the vocab necessary to read the sign above: We must stay outside. It's the little things...baby steps! 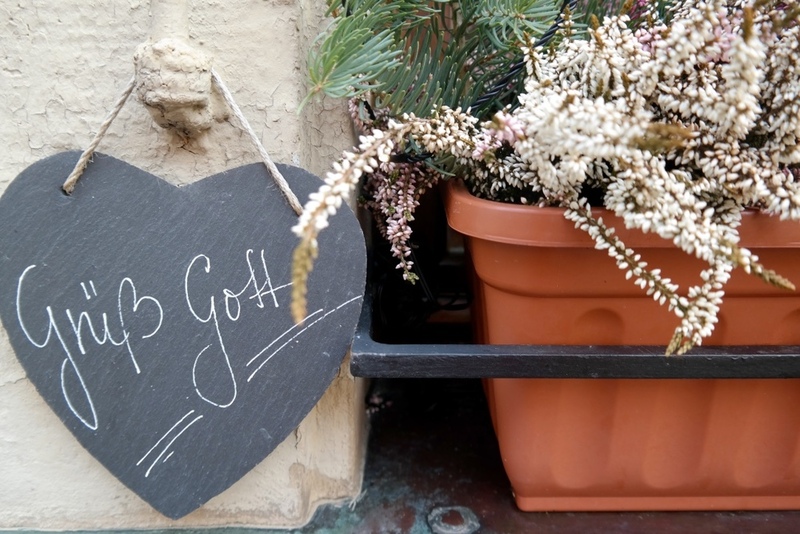 Grüß Gott ("Groos Gohtt") is a common, more formal way of greeting people here; Servus! ("Ser-voos!") is a common, informal way of saying hello in Bavaria. If you ever find yourself in Rothenburg, I highly recommend staying at Villa Mittermeier located just outside the city gates. It's beautiful, super warm and cozy, and the staff is so nice. They have a restaurant downstairs, and we had a good breakfast there one morning. We walked around a lot, to the main square and the side streets, stopping in little stores and getting snacks or a meal at restaurants and cafes. The Christmas markets were the main attraction for us, and we visited some of the Christmas shops located near the markets. I'll give you some fair warning: these shops are so overpriced, and I've found the same products (or nicer) here in Munich for much cheaper. I think these stores rely on international guests (and there are many) who have to buy gifts now, and who will pay their exorbitant prices. Nice try, guys. Schneeballs ("snowballs") are a Rothenburg specialty. I (surprisingly) am not a big fan. They are basically just leftover pie crust baked together and covered in sugar or chocolate. So kind of some of my favorite ingredients...but it didn't do much for me. We had a great time in Rothenburg, and if you ever find yourself in southern Germany, I recommend stopping by. An ideal time to go is obviously Christmas, but I know the city would be beautiful any time of the year.